The Wörthersee Plus Card and Winter Wörthersee Plus Card offer lots of experience and advantages. Admission to more than 100 excursion destinations. The new JUFA Hotel Stift Gurk**** opened in June 2018 and offers a fantastic place for nature lovers, families and pilgrims to spend a really special holiday. Alpine meadows stretching as far as the eye can see, densely forested mountainsides and the cheerful babbling sounds of the river Gurk can be enjoyed in the area around the market town of Gurk, which is at the heart of the unspoilt Gurk Valley. It is no surprise that it is such a popular destination for so many pilgrims! The new JUFA Hotel in Carinthia is situated in historic surroundings, so our guests can experience a truly unique atmosphere. The hotel is located in the historic wing of the chapter house and the priory building that are connected to Gurk Cathedral and provides a truly unique setting for every occasion, whether you are on holiday with all your family, on a choir tour, taking part in a special conference or on a pilgrimage. If you are looking for idyllic natural surroundings, want to satisfy your wanderlust and are interested in local history, then you have to come to just the right place! The JUFA Hotel Stift Gurk**** is full of historic charm and is a perfect place to spend a quiet and relaxing holiday. The hotel’s location is ideal for discovering the exciting culture and history of the region, for example, you can access the famous Gurk Cathedral directly from the hotel, where you can visit the tomb and treasure vault of the blessed Hemma of Gurk. The region is well-known for its herbs and you will have plenty of opportunities to discover these botanical delights right at the hotel, where they feature prominently on the agenda every day. For example, you can choose to try out a herbal pillow for a relaxing night’s sleep, or perhaps discover the therapeutic benefits of a herbal infusion at the tea bar. There are so many regional culinary delights to enjoy. Pilgrims to the region love to partake in a drink of Gurktal alpine herb schnapps and to fortify themselves with regional and delicious food. You might also have the chance to taste the delights on offer at the popular Gurktal Ham Festival! The cathedral gift shop offers a range of delightful gifts to take home for family and friends. There are also a range of leisure activities to enjoy, such as the open air swimming pool in Gurk and the local history museum in Weitensfeld. There are many other sites of interest to explore that are located slightly further afield. For example, you can visit Straßburg, which is surrounded by 16 churches, Lake Kraiger, or maybe explore loftier heights in the Hochrindl mountains, a region that also has plenty to offer fans of winter sports. Incidentally, you are welcome to bring along your four-legged friend. The hotel facilities and the staff are very dog ​​friendly. The JUFA Hotel Stift Gurk**** is located about 35 minutes north of the state capital Klagenfurt am Wörthersee. Free parking for cars and buses is available directly at the hotel. On arrival, we recommend the direct access to the hotel parking lot (entrance Gurk left / in front of the round tower left again). You are welcome to store your luggage at check-in on the suitcase parking at the lift. A driveway over the collegiate courtyard is not possible! For more detailed information on how to reach us by other forms of public transport, please refer to the ÖBB and WESTbahn websites. As destination station we recommend the stations St. Veit an der Glan, Friesach or Treibach-Althofen. 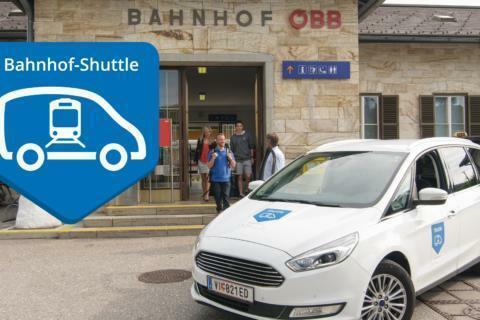 For further travel, you can select our JUFA Hotel Stift Gurk*** directly at www.bahnhofshuttle.at and book a shuttle. 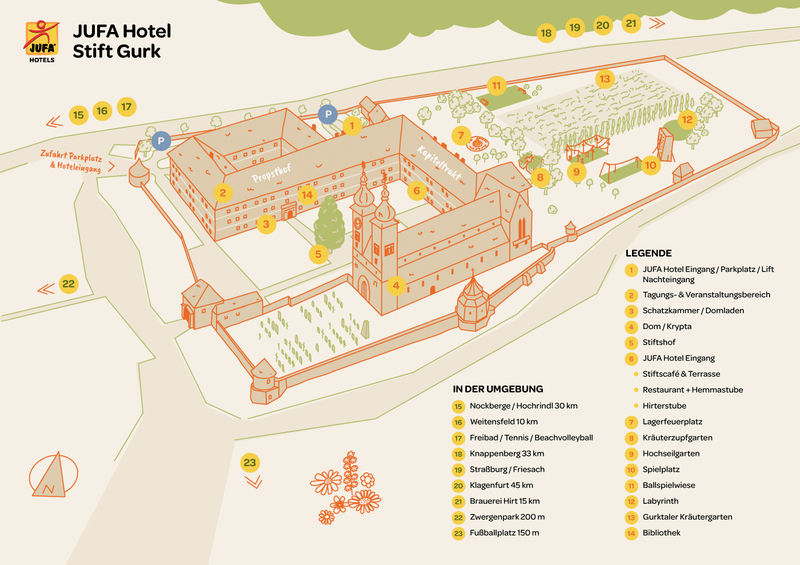 The map gives you an overview of the JUFA Hotel Stift Gurk**** and destinations in the area. The Wörthersee Plus Card offer lots of experience, fun and advantages in summer and winter! Admission to more than 100 excursion destinations in the three regions Wörthersee, Klagenfurt and Middle Carinthia in summer and winter. The town of Gurk is famous beyond the borders of Carinthia because of the cathedral, its history and fantastic location. The Pope himself once visited. This place of worship was built in the Romanesque style and is aesthetically one of the most important ecclesiastical buildings in Europe. It is possible to see more than 300 objects of Carinthian religious art in the recently opened treasury. In the Thermal Römerbad in Bad Kleinkirchheim you can spend relaxing hours in the midst of a fantastic mountain scenery. In the beautiful sauna and wellness area and in cozy quiet zones you will forget the everyday stress. So immerse yourself in a world full of beauty that offers both, experience and silence. As a mining community and hometown of mountaineering legend Heinrich Harrer well-known, since ‘7 years in Tibet’ world-famous. That and much more is Hüttenberg. The mine Knappenberg is especially popular with children. The ‘Path of Dialogue’ leads directly to the Lingkor at the Heinrich-Harrer-Museum and the Mineral Museum takes you to Europe’s largest mineral resource in a sparkling world. By the way: With the Kärnten Card, admission is free! Our tip: Bowling & large indoor world of experience in the JUFA Hotel Knappenberg****. 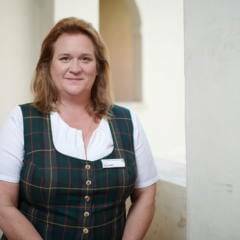 The hotel management Annette Kuzucular and her team are at your disposal for any questions! Im interested in the offer "JUFA Hotel Stift Gurk****" in the .